The Giants have become the new Patriots of the NFL when it comes to disclosing information about injuries. Janoris Jenkins and B.J. Goodson, two of the highest graded NYG defenders from week 1, surprisingly were on the team’s inactive list prior to kickoff. On the flip side, star receiver Odell Beckham dressed and made his 2017 debut on Monday Night Football against the 1-0 Detroit Lions, led by the NFL’s highest-paid player, Matthew Stafford. On Detroit’s second drive (following the Giants’ three-and-out that included a sack), Stafford led the Lions on a 9-play drive that ended with a 3rd-and-12, 27-yard touchdown pass on a vertical route to Marvin Jones over Eli Apple, who never located the ball. Things were looking up soon after, as New York responded with their own 8 play scoring drive that resulted in rookie tight end Evan Engram’s first career touchdown. With the game tied 7 a piece, the Lions took over the field position battle thanks to two rookie mistakes. First, Engram’s celebration penalty, and second, kicker Aldrick Rosas’ kick out of bounds. The defense however stepped up when Jason Pierre-Paul forced a sack-fumble, which was recovered by Devon Kennard. It took just one play to hand the ball back to Detroit after Manning threw a pass slightly behind Engram, who tipped it into the arms of linebacker Tahir Whitehead. Fast forward 5 plays and Stafford throws his second touchdown, this time to tight end Eric Ebron who simply outran safety Darian Thompson on a crossing route. Both defenses held their own towards the end of the second half, with Detroit sacking Manning 3 times in 6 drop backs, gaining more field position advantages. They ended the first half with a 6-play drive capped off by a 56-yard field goal that hit the cross bar and bounced over, by Matt Prater. A sign of the Giants coaching staff having little-to-no confidence in the ability of this offense was the fact they let the clock run from 1:20 all the way down to :35 as the Lions field goal unit got on the field. That was an opportunity that Ben McAdoo simply looked past, scared that the offense would end up giving the ball back to the Lions. Down 17-7, the Giants put together arguably their best drive of the night that got them as close as 1st-and-goal from the 1-yard line. An opportunity like that resulted in just a mere 3 points, largely attributed to a holding penalty on guard Brett Jones. At the start of the 4th quarter, the biggest turnaround/turning point of the game occurred. Manning threw a perfect deep ball up the right sideline to Brandon Marshall, the hyped free agent signing who has made zero impact so far. It would have resulted in a 30+ yard gain but instead, Marshall let the ball slip right through his hands, an inexcusable drop. Two plays later, Lions rookie punt returner Jamal Agnew returned a punt for an 88-yard touchdown, making it 24-10. The air was sucked out of the team and fans at that point and it was never recovered. The Giants’ top targets were dropping balls, passes were being thrown well before the first down marker on 3rd/4th down, and the running game couldn’t find an inch. Slightly different path, but the same result for the offense that hasn’t had an identity in years. The Lions played a conservative, clock-eating style of offense and the Giants lost, 24-10 at home. Eli Manning: 22/32 – 239 yards – 1 TD/1 INT – 87.9 rating. Upon watching the offense a second and third time respectively, Manning didn’t deserve to be thrown under the bus by Ben McAdoo. He had pressure at his feet and in his face often, again, and still made some big time throws despite it. If Brandon Marshall and Evan Engram hold onto downfield passes that Manning put on the money, we are talking about a 300+ yard game and maybe even a win. One glaring hole from the night, however, was a play in which Manning went to the ground before even bring touched by Lions defensive end Ezekiel Ansah. He needs to rise above a situation like that and stay strong when the pressure is on. Shane Vereen: 6 att – 28 yards – 4.7 avg. Also picked up 27 yards on 3 catches. There is a sense of security and more potential with Vereen on the field. A better blocker, receiver, and playmaker in space with the ball in his hands. One of the game-plan changes this team needs to make is get the ball in his hands more than 12 times per game, minimum. Vereen has always been an assertive runner WHO can create on his own and unfortunately that is what the NYG backs will need to do all year. Orleans Darkwa: 3 att – 17 yards – 5.7 avg. Darkwa’s first rush went for 11 yards. The opportunities have been sparse for the Giants’ most physical back, but he can move the chains by falling forward and pushing piles. He should have been in there on the Giants rushing attempt from the 1-yard line. Paul Perkins: 7 att – 10 yards – 1.4 avg. Also added 2 catches for 12 yards. The running back position appears to be up for grabs, as Perkins simply hasn’t been making plays. Yet once again, he hasn’t really had the opportunity to find a rhythm. The running lanes aren’t there but Perkins is still showing too much hesitation and timidness. Odell Beckham: 4 rec – 36 yards. In his first game back since the August 21 injury in Cleveland, the Giants limited his snaps, 61% to be exact. There was a visible lack of burst and confidence to his movement and a player like him needs that to be effective. His biggest impact on the game may have been the attention he demanded from the Lions on his deep routes. He was triple-covered four times. Sterling Shepard: 2 rec – 23 yards. A near touchdown where he was clocked by safety Glover Quin while reaching for the ball could have changed the game. By no means was it a “should have had it” play, but someone needs to step up and make something happen eventually. Shepard had a couple of rushing attempts as well, as he appears to be the most explosive player this team has with the ball in his hands until Beckham is fully back. Brandon Marshall – 1 rec – 17 yards: Was on the wrong end of one of the most influential plays of the night. A horrendous deep ball drop that helped alter the momentum of the entire game. On the next drive, Marshall showed a poor effort on a ball that was slightly above his head on a crossing route. The issue with Marshall his entire career is how he approaches the game when things aren’t going his way and the team is losing. Is the desire to win burning inside of him? Or is he going to continue to play like a has been that is looking forward to retirement? Evan Engram: 4 rec – 49 yards – 1 TD. With each week that passes, Engram is getting more and more comfortable in the Giants’ offense. His ability to get open and make plays after the catch are going to be crucial to any sort of offensive turnaround. His first career touchdown was unchallenged by the Lions’ defense due to a playaction fake. Late in the game, Engram dropped a 29-yard touchdown pass after being hit by cornerback Darius Slay. A tough play indeed, but one that could have changed the outcome of the game. Engram also graded out poorly as a blocker with a couple of bad breakdowns in crucial situations. Rhett Ellison: 2 rec – 21 yards. To this day, I can’t recall a target intended for Ellison where a positive play wasn’t the result. If the Giants want more blocking presence on the field without fully compromising their playmaking potential, Ellison needs more snaps. He was only on the field for 39% of the plays. With that said, Ellison was beaten badly on two key running plays as a blocker. Jerell Adams: 1 rec – 38 yards. The Giants biggest play of the night was to Adams up the right sideline. Manning was under heavy pressure which forced an under throw. But a nice adjustment to the ball by Adams brought the Giants to their best field position of the night. It was Adams’ only play of the game and he showed that he could be a missing piece to an offense that needs more blocking presence without fully compromising play-making potential. Tackles: Ereck Flowers, for the second straight week, graded out the worst on the line and had another bottom-5 performance from around the league. Poor footwork. Poor knee bend. Inaccurate hands. Lack of hustle and grit. There is zero difference between the rookie version of Flowers and the year 3 version. Patience is one thing if there are signs of progress here and there. Stubbornness is another. Throwing him out there to protect Manning’s blind side is the latter. It’s time – Flowers needs to be benched or moved. Justin Pugh shifted over to right tackle after the first drive as a result of Bobby Hart’s ankle injury. His performance on the outside was good enough to sell me on the idea of moving him to his college position, left tackle, full time. Interior: John Jerry and Weston Richburg graded out with positive performances. After Jerry’s split-blunder on the Lions first sack of the night, he played well enough. He stayed on his man, as his assignment was being responsible for just one tackle the rest of the game. Richburg played very solid assignment-football, allowing just one tackle himself and very good pass protection when he was left alone. Brett Jones, who played all but one drive at left guard, was up and down. He allowed a cover-sack and committed a big holding penalty. While he doesn’t look good out there, especially with adjustment-based lateral movement, his grit and fight is something Flowers could take notes on. He is a true, blue-collar hustler who makes up for shortcomings by simply outworking his opponent. Jason Pierre Paul recorded his first sack, which also forced a fumble in the 2nd quarter. His overall impact on the game was better than the 3 tackle-stat sheet leads on. He was disruptive and pursued well to the sideline, forcing the Lions’ running backs inside on a few occasions. Olivier Vernon forced Lions tackle Greg Robinson into a few penalties, but overall his impact wasn’t anything stand out. His match-up in this contest should have led to more production. Too often was he being neutralized by a lone blocker against the run. Romeo Okwara recorded two pressures in limited action. He continues to be a solid 3rd-down threat who can line up anywhere. The Lions tried to keep Damon Harrison away from having an impact. They ran to the outside so often and double-teamed him on most passing plays. Even on a “quiet” night, Harrison was still in on 6 tackles and controlled the inside running lanes when Detroit did try to go there. Rookie Dalvin Tomlinson got his first start and I think it will be his for the rest of the year. He was active both in the box and in pursuit, showing plus athleticism and range. He is going to be a major factor moving forward. Jay Bromley and Robert Thomas failed to make a positive impact on their limited snaps. The pregame surprise of the night was B.J. Goodson showing up on the inactive list, out with a shin injury. The NFL week 1 leader in tackles was replaced by undrafted rookie Calvin Munson. The Lions made him move laterally often which he struggled with early but made some impact play tackles late in the game as his reads became more confident. Munson did a nice job of making himself small through traffic and filling lanes. He was on the field for every snap. Devon Kennard only played about half the team’s defensive plays, but had a disruptive night. He recorded a QB pressure, QB hit, and tackle for loss. He was very stout against the run and displayed versatile pass rushing by breaking through the Detroit line from different spots. Jonathan Casillas recorded two tackles for loss, but was also ridden out on a couple of Detroit’s bigger running plays. J.T. Thomas was hurt, again, early in the game. Landon Collins and Darian Thompson both played every snap. Collins didn’t make any impact plays other than a couple of physical downhill hits against the run. Thompson was beat by tight end Eric Ebron on Detroit’s second touchdown, but broke up a pass later in the game. His range against deep routes appears to be a step behind and his impact as a run defender is minuscule. He had a fairly simple opportunity for an interception in the 2nd quarter, but he badly mistimed his leap for the ball with poor body control. On the Lions’ first touchdown drive, Nat Berhe was assigned to spy Matthew Stafford on a 3rd-and-12 play. He over-pursued badly which allowed an easy cutback lane for Staffod to scramble for a 1st down. The Lions scored 3 plays later. With Janoris Jenkins on the sideline injured, Eli Apple and Dominique Rodgers-Cromartie were both on the field for every snap. Both had every up and down nights. Apple’s allowed touchdown to Marvin Jones was something we have seen since the beginning for him, trouble locating the deep ball with body control. He had solid coverage as usual, but that’s only half the battle when defending the pass. The Lions were noticeably attacking him. He made a few physical plays and deflected a pass later on. Rodgers-Cromartie led the team with 11 tackles, most of which were against the run. He had two bad missed tackles that resulted in extra yards for Detroit in key situations, however. Ross Cockrell got his first real playing time with the Giants and played well. Interesting to see him ahead of Michael Hunter on the depth chart, as he out-snapped him 39 to 1. K Aldrick Rosas: 1/1 – 25 yards. Easy chip shot, but a kick out of bounds in the 2nd quarter added to a field position loss. P Brad Wing: 5 punts for 47.8 yard average. An overlooked mishap for the team was Wing out-kicking his coverage by 10-15 yards on the return for a touchdown. That ball needs to be higher, not as far, so the returner has less space to work with upon catching the ball. Return: Dwayne Harris had a quiet night. I’ve seen this team play a lot since the start of last season. Matthew Stafford is certainly inching his way towards the elite level. His arm talent is second to none in this league, he has sneaky mobility in and out of the pocket, and he has proven to be unfazed by big moments several times. Detroit is 110% justified in giving him the contract they did, as there may be one or two QBs in the league I take over him for the next 5+ years. The secondary is playing better in the first two weeks than what I saw all of last year, most notably nickel corner Quandre Diggs. Darius Slay is the best corner you’ve never really heard about, and even the Nigel Lawson/D.J. Hayden split can hang with many high-caliber WRs in certain matchups. They are a solid duo who will be on the field based on who the other team has running routes. 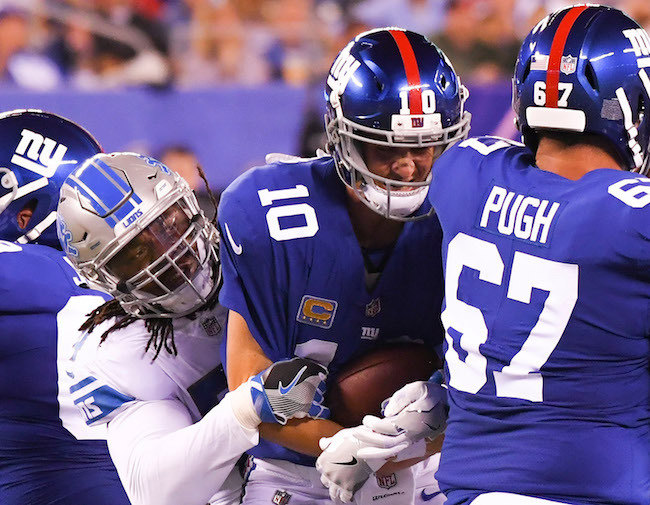 The Giants offensive line is a mess, and the Lions are somehow piecing together solid performances with players the Giants could have easily signed, most notably Ricky Wagner and T.J. Lang. They aren’t superstars and I won’t pretend they are, but the gap between them and what the Giants are throwing out there is astronomical. That’s how bad this OL personnel is for NYG. And it makes this front office look bad for not adding any veteran piece of value in free agency. Everything looks worse when a team is losing. Everything gets questioned and that is often a result of overreacting. But sometimes, bold statements are justified. The debate of what Ben McAdoo will be is still very much alive. Throwing your first-class, team-first-always quarterback under the bus to the NY media was a low blow. McAdoo is as blah as it gets in interviews as he doesn’t like to dive too deeply into questions and information. Was his comment about Manning, which he has done before, a sign of frustration? Will that spill over into the bigger egos on this team? McAdoo needs to remember, the Giants haven’t accomplished much and the offense has never been worse, since he’s been a part of the organization. I touched on this briefly above, but I will repeat. The best move for this offensive line is to move Pugh to left tackle right now. No trades or signings. Pugh’s value to the team is best suited there and Flowers has two options. Play right tackle so they don’t have to rely on D.J. Fluker or Chad Wheeler, or sit on the bench. I understand he hasn’t played on that side since early in college but he is not a left tackle in this league, something I have said since he was drafted. There has been no improvement, no progression with him. If anything, he might surprise and simply play at a higher level over there. Time for this pass rush to step up. I wouldn’t put the below average label on them yet, but making 1 or 2 plays via the pass rush isn’t enough, especially with a line that has Greg Robinson playing left tackle. Granted the Lions were barely dropping back in the second half, but it is time for these guys to step up. They have as tough a test as they will have all year in Philadelphia next week. Show us you deserve all that money, Vernon and JPP.